Buju Banton was born Mark Anthony Myrie in 1973 in Kingston. 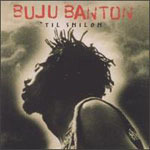 It seems that Buju was his Jamaican name as pickney and that Banton was added as a tribute to Burro Banton. During the 90's he was one of the most popular Dancehall artists. He started his career as a "slackness" performer singing about raw sexuality and homophobia ("Boom Bye Bye" is the classic example). He was not much appreciated for this. Then he started again as a Rastafarian. But I have always asked myself, especially in recent times (2006-2007), if that was pure fondness or only a pure commercial move. In this context it does not matter. This set is considered by many a masterpiece. If probably it does not deserve that stature, it is for sure a strong album with some very good songs. The album is acclaimed for putting together the Dancehall and Roots approach. It is actually based more the former than the later. Maybe that is the reason that I never felt particularly touched by it, since I am on the Roots side. More than that his rough voice, as with other Dancehall singers, bores me. What deserves a real attention is : the Nyahbinghi influenced "Til I'm Laid To Rest"; the firm position expressed in the lyrics, more than the music, of "Murderer"; "Untold Stories" is one of those songs that will be always remembered and played in the remote future too... beautiful beautiful song; and "What Ya Gonna Do?" featuring Wayne Wonder. Some Dancehall fan would have given at least four stars or more, because the set is strong if seen from that side. But three is my last word.